The Eden Raised Garden Bed 4ft x 4ft x 17.5in is a great addition to any garden or landscape. The Eden line of raised garden beds in a functional alternative to in ground gardens. Constructed from solid fir wood (which is rot resistant), easily assembled with no tools needed, takes an average of a few minutes to assemble. The custom design allows for a solid raised garden bed with minimal efforts and again no tools needed for assembly. Standing at 17.5 inch tall, this design allows for deep rooted plants and perennials and is easily expandable by adding another Eden Raised Garden Bed right on top through our unique locking design. The design allows for multiple layers to be added as your garden needs change. This sturdy Raised Garden Bed features a impactful 12" height also allowing for deeper root development. Measuring 4 feet by 4 feet, this Garden Bed provides ample room for planting Herbs, Vegetables and Flowers. Made from kiln dried solid fir wood this Raised Garden Bed includes an Elegant Cappuccino coloured stain with Weather Resistant Treatment. Corners include Decorative Posts which also Add Strength to the unit. This Raised Garden Bed also includes An Additional Post allowing for different Designs to suit your Garden Space. Simple assembly achieved through tongue and groove design. Minimum amount of assembly required. Instructions and Hardware included. 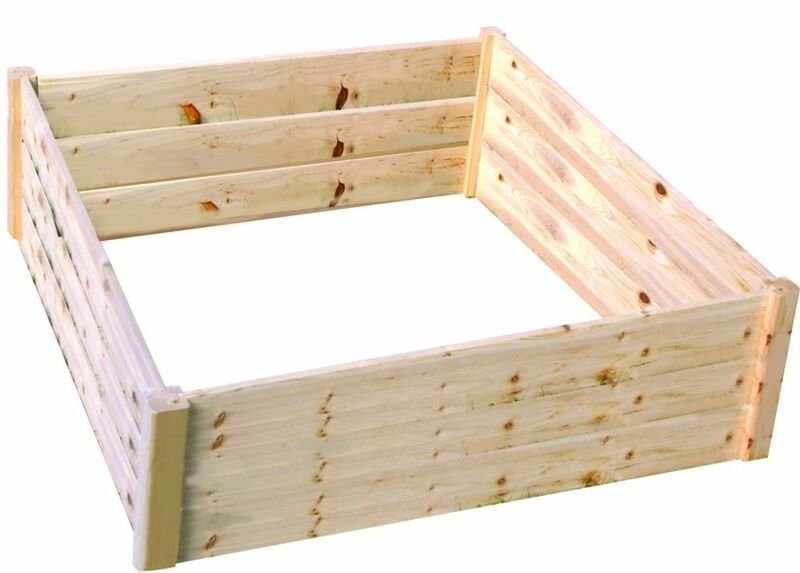 Quick Assembly Raised Garden Bed (4 ft. X 4 ft. X 17.5 inch) The Eden Raised Garden Bed 4ft x 4ft x 17.5in is a great addition to any garden or landscape. The Eden line of raised garden beds in a functional alternative to in ground gardens. Constructed from solid fir wood (which is rot resistant), easily assembled with no tools needed, takes an average of a few minutes to assemble. The custom design allows for a solid raised garden bed with minimal efforts and again no tools needed for assembly. Standing at 17.5 inch tall, this design allows for deep rooted plants and perennials and is easily expandable by adding another Eden Raised Garden Bed right on top through our unique locking design. The design allows for multiple layers to be added as your garden needs change. Quick Assembly Raised Garden Bed (4 ft. X 4 ft. X 17.5 inch) is rated 4.0 out of 5 by 2. Rated 5 out of 5 by HandyDan from This product is great. Easy to set up and enabled us to establish a nice garden for the small sp... This product is great. Easy to set up and enabled us to establish a nice garden for the small space that we have. Would recommend this product for similar situations as ours. Rated 3 out of 5 by ChrisFurin from I purchased these beds to replace a set of old rotten ones on a home we purchased. Overall the fi... I purchased these beds to replace a set of old rotten ones on a home we purchased. Overall the final product looks very nice, but the quality is not that good. The problem is the wood is VERY thin. One of the side brackets cracked when sliding in the the wood slots. I had to use wood glue to repair it since they include no extra parts. I have to say these are quite expensive for what you get. The look nice, but I wish they were better quality.